Parking Australia, the national body representing the interests of the parking industry in Australia, has elected three directors, (two are new to the Board) at the Annual General Meeting of the Company held in Adelaide on Tuesday. The two new directors to join the Parking Australia Board (as voted by Parking Australia members) are Liam Carroll from City of Darwin and Ben Williams from Smart Parking Limited. Ben Williams has over 9 years’ experience in the Australian parking industry, including roles with SKIDATA, Wilson Technology Solutions and currently as the Australian National Sales Manager at Smart Parking Limited. Ben has fostered strong relationships both within Smart Parking and the wider parking industry community, in both Australia and New Zealand. He brings real-world knowledge on the realities that councils, retailers and other parking operators face, making him determined to be part of the ever-changing parking environment. Liam Carroll has managed the parking operations at the City of Darwin at senior management level for the past 17 years. During this time, Liam has evolved and improved the City of Darwin’s parking systems and process, with the adoption of appropriate technology including the introduction of pay by phone technology in February 2018. Liam is an accountant by profession and a fellow member of the Australian Institute of Company Directors. He has previously acted on several boards within the tourism industry, including the marketing board for the promotion of Darwin’s CBD. Sharon Prior praised the contribution of fellow board member, Graham Arndt, who was eligible for re-election, but decided not to stand. Graham Arndt, Director of Operations and Maintenance at Curtin University of Technology, served on the Parking Australia board, and the Committee of Parking Australia’s predecessor organisation for 8 years. “He has been integral in the many initiatives that Parking Australia has engaged in and represented the university sector in a fair and professional manner. 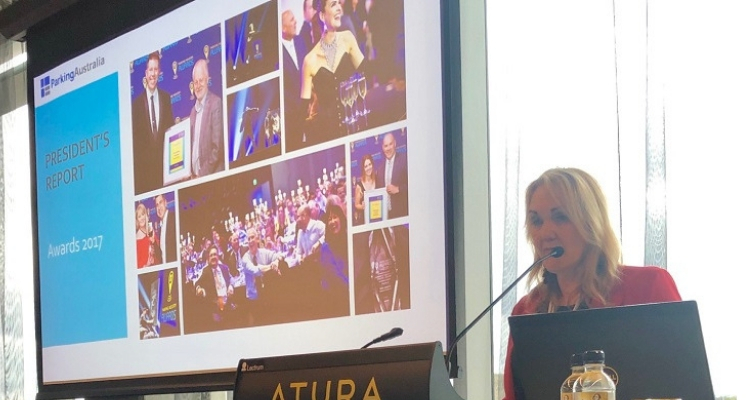 His role as Chair of the Future of Parking Committee has delivered some strategic and innovative discussions and formed the basis on which we will continue to develop”, said Sharon Prior, President of Parking Australia. Pictured: Sharon Prior delivering the President’s Report at Tuesday’s AGM.